One of my favorite cut of meat is Osso Buco, which literally means “bone with a hole” (Osso “bone”, Buco “hole”). It is the cross-cut of a veal shank with a marrow hole in the center. 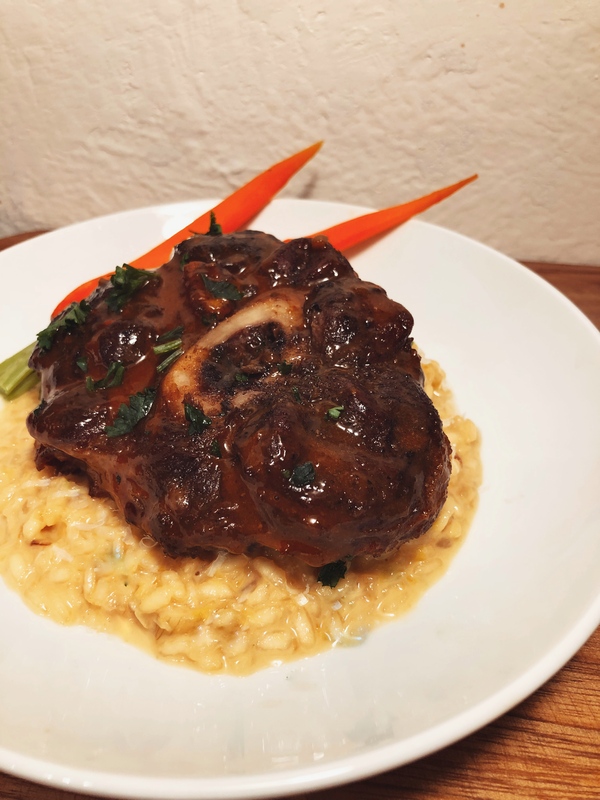 The veal shank is usually relatively cheap and flavorful, although tough, low and slow braising makes it tender & juicy. The marrow in the bone is silky and smooth, and perfectly caramelized to bring out the amazing flavors hidden in the bone! Take the browned shanks out of the pan, and in the same pan, add the chopped pancetta, onion, celery and carrot, turn the heat down to medium and cook them for about 10 min or until the onion has turned translucent. Add the minced garlic half way through since garlic burns very easily. Place the shanks in the pan, and add the broth until they almost submerge the shanks. Cover it and let it slowly braise in a 175C or 350F oven for about an hour, then remove the lid and cook for another 30 min to thicken the sauce. You can add 10 min at the end if you want a thicker sauce. Serve it with some polenta, risotto or mashed potato. I made Risotto alla Milanese or the Saffron Risotto which is a traditional side for this dish, you can find how to make Risotto here, and Enjoy!